David Weir and Hannah Cockcroft were among the British Paralympians enjoying a winning feeling once more at the Anniversary Games in London. David Weir has rounded off the Paralympic Anniversary Games with a repeat of his London 2012 success, clinching the T54 mile by a wide margin of victory. Weir, who claimed four golds last summer, took the title with a winning time of three minutes and 16.4 seconds at the Olympic Stadium. The final day had seen other British success with Hannah Cockroft claiming the T33/34 100m title, Dan Greaves winning the F42/44 discus and Richard Whitehead racing home first in the T42 200m. Jonnie Peacock's bid for the T43/44 100m title at the Paralympic Anniversary Games has fallen short after world record runs by Brazil's Alan Oliveira and the USA's Richard Browne. Oliveira won the final in a new best time of 10.57, while Browne broke the T44 record with 10.75. Peacock, though, still achieved a career best time of 10.84 to finish third at the Olympic Stadium as the three-day athletics event comes to an end. Olympic heptathlon champion Jessica Ennis-Hill has thanked her fans after she made her comeback from injury at the Olympic Stadium. Such amazing support in the stadium today! Thank you!! Great memories!! Paralympic athletes have been gearing up for their return to the Olympic Stadium as part of the London Diamond League Anniversary Games. Great race today!! 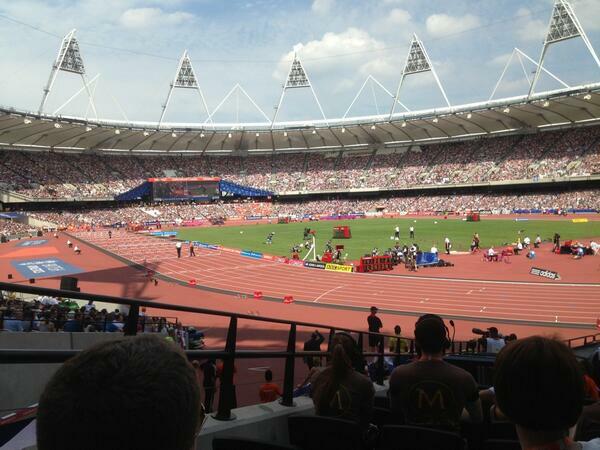 Loved being back at the Olympic stadium again.. Great memories!! Thanks everyone for coming out to support!! Jamaican sprinter Usain Bolt has paid tribute to the "great" London crowd after competing in the Diamond League Anniversary Games athletics meeting at the Olympic Stadium. Bolt, who won three golds in London last summer, won the 100m event yesterday and today teamed up with his fellow countrymen to win the 4x100m relay. Catch up on all the action from London's Anniversary Games. Olympic heptathlon champion Jessica Ennis-Hill has told ITV News she has "mixed emotions" after making her comeback from injury at the Olympic Stadium. The 26-year-old competed in the long jump and hurdles at the Anniversary Games but her preparation for the London Diamond League Anniversary Games athletics meeting was hampered by an Achilles tendon injury. Ennis-Hill said she came through unscathed and the London 2012 gold medallist will now turn her attentions to the upcoming World Championships in Moscow. Catch up on all the action from the Anniversary Games so far. Mo Farah has told ITV News it was "emotional" to be back one year on from his two gold medal-winning moments at the Olympic Stadium last summer. Farah breezed to victory in the 3,000m event at the Anniversary Games in London today and set a new personal best time of 7:36.85. Britain's Katarina Johnson-Thompson has won the women's long jump event at the Anniversary Games. Double Olympic champion Jessica Ennis-Hill finished eighth and will now head to Moscow for the World Championships in Moscow.